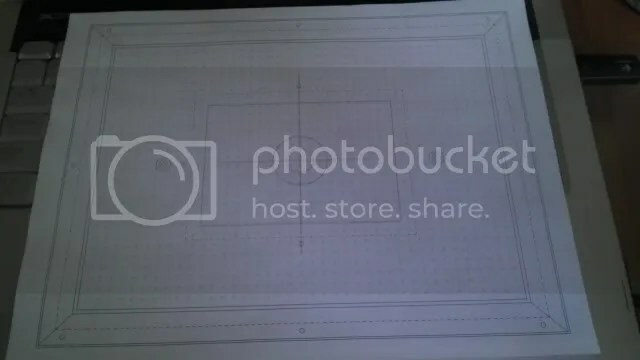 Over I’d say the past few months I’ve been in the planning phase of a new vacuum forming machine to replace my home brew version that I’ve been using the past few years. Though it works and for one-off casings, it suits the purpose. However there are many flaws in the system and is quite tedious when making multiple casings. This new design is going to be a combination of many successful home-made vacuum former styles and designs as well as taking a few professional styles and incorporating the principles of those into the unit. It’s going to be made up of mostly aluminum and MDF for main body, but is also going have some advanced control mechanics like Pneumatic cylinders, range selection and a new type of vacuum table that may change the way home-made vacuum formers a thought of for new builders. Now I don’t have the skills or the tools to be building such a machine, but being in my line of work, you meet people who do and once you find one that is all about these kinds of projects and is willing to help out because he too would have a use for the machine, well that’s an opportunity I can’t pass up! Jon Seik, part owner of a machine shop called [Complex Mold & Machine] in Holderness, NH is helping/pretty much doing this project for me, but I’m sourcing and paying for all the material to build it. The good thing about having his help is this project is getting drafted fully in a CAD program and will be cut and built using CNC machines. Far more precise than anything I could have done on my own by a very long shot. Good thing too, as our vacuum table will have to be custom drilled and by the looks of it, there’s going to be almost 1200 holes to drill! Good luck doing that by hand, yeah…NO! But I say we have another week or two in the planning phase with this, still a lot of work ahead of us with the heat box especially, but we’re making progress and acquiring parts on a daily basis. Stay tuned because this project is going to be one of the coolest I’ve ever participated in!